I watched a new department manager of projects introduce himself to a staff of 100 engineers. The one phrase that stuck in my mind was, “I am very results oriented.” Now project engineers, including me, tend to be results oriented anyway, so the remark passed without much thought. He was a very average manager who passed into corporate mediocrity with little fanfare… 25 years ago. Our personal and corporate lives are the same today. Very few people and organizations can articulate “why” they do what they do in a way that inspires anyone else to follow, join or buy. 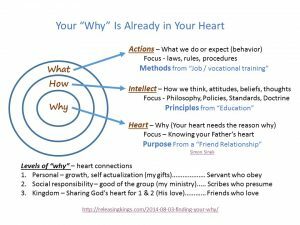 “Why” is deeply embedded in our heart or subconscious. When you touch the “why” at the heart level in a person or an organization, then people are moved. Expressions of the heart are compassion, nurture, creativity, intuition, spirituality, enthusiasm and initiative. As depicted in the graphic below, what we do is the outer layer of our activity, how is just below the surface that explains how we think, and our why is embedded in our hearts – the real engine of our personal or organization life. The key is that people do not do what they are told, or believe what they are taught… we all live out the script that is written on our hearts. It is manipulative for leaders to believe we can regulate behavior or impose our own ideology to change the thinking of others. Real leadership inspires hearts with “why” before it changes minds or asks for action. Corporate profits and religious obedience are not heart motives. What – If we base our lives and communication around what we do, we tend to create a superficial image of ourselves in the eyes of others. Our focus is limited to results and behavior, which are logically governed by very uninspiring rules and procedures instilled in others with job training or condescending lectures. That track leads to unions, and leaves the unmotivated followers with nothing more to focus on than how much they are paid for every hour of their lives lost in a meaningless job. How – Educating people to think differently so they behave in a more enlightened manner is the bastion of intellectuals. We give degrees and certificates to those who endure this class room approach to adopt our philosophy, policies and standards. This mental approach to change attitudes is still focused on the teacher’s material – you can tell, because teachers who believe that changing attitudes will change behavior have no capacity for listening and no concept that people have hearts which contain the roots behind the beliefs in our minds. Intellectualism is preachy, cold, proud and uninspiring. Why – The real reason for all of our past, present and future behavior and words is the why already embedded in our hearts or subconscious. We each carry our own clearly scripted (but hidden) heart logic that represents the why behind everything we say and do. All of our explanations of what we do or how we think are simply camouflage for what is concealed in our hearts. When we express what is really in our hearts, it can resonate in the hearts of others – that’s what inspires action. Hearts must be inspired before minds can change. Great leaders always start with the “why” embedded in their hearts. Great organizations do the same. When we communicate at a heart level, our words carry a prophetic overtone that others can hear in their own hearts. Hitler used it for evil; Martin Luther King used it for good. They both spoke out of their hearts, captivated and motivated multitudes, not just to listen, but to change the world by their actions. Why find your why? – When we discover the “why” in our own heart, we become connected with ourselves so that our actions, thoughts and words are integrated with our hearts… no more saying one thing and doing another. It stops the self-sabotage, and aligns our hearts, minds and deeds in one courageous direction. Everyone else can see the difference; purpose inspires confidence. Our lives start working practically, emotionally and financially. God wrote your “why” in your heart – There is one more secret in discovering our why. God wrote it there in our hearts. We were each designed specifically for our why. When we discover our why, it will explain our life… our history, our talents, our personality, even our future… the puzzle pieces will come together in a mosaic of God’s handiwork. At the first level, you will see personal growth, and your gifts will begin to function. At the second level you will see the benefits for others in terms of social responsibility or ministry. At the deepest level you will begin to feel the heart of God himself. You will see his heart for you and share his heart for others. That’s Kingdom. You will see your role and the role of your organization in the context of a much bigger strategy of the Father to bless nations. It’s spiritual! It’s practical! And it’s fun! 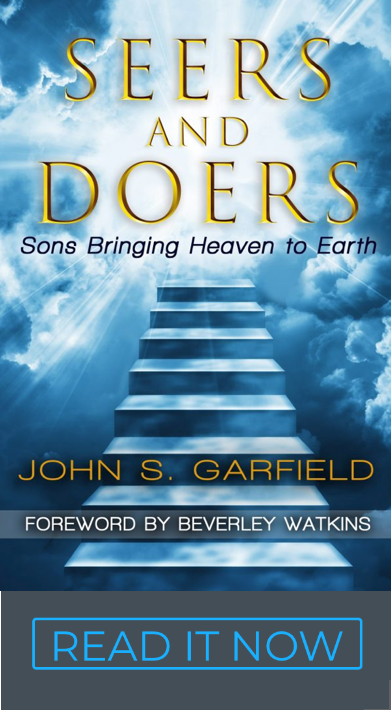 Kingdom purpose is the most satisfying and exciting “why” our hearts can carry. When you connect with your heart, you will find your tribe, your vocation and your ministry with the other people who hear the same music and resonate with a similar theme in their life purpose. None of us are an island. Our lives are intertwined with those who will help make our dreams come true… and we will do the same for them. It starts when you find the “why” in your heart. God has others waiting in the wings to hear your song. If you enjoyed this newsletter you might also enjoy Putting Love in Leadership and Fathers and Managers. Simon Senik also had a great secular video that is worth watching called How Great Leaders Inspire Action. God already has Simon working on a reformation and you can hear a prophetic quality in his ideas.